There were two public schools, the British School and the school over the old Butter Market. The British School in Bath Street was a mixed school. Adeline attended the British School in Ilkeston — in both the 1861 and 1871 censuses she appears as a ‘scholar’. The school was built in 1845, on the west side of Bath Street, just below (north of) Mount Street, opposite what is now the Albion Centre. Bagshaw (1846) describes it as a large brick building with projecting wings, costing £780 which included the cost of the land, raised by voluntary subscription, and aided by a government grant of £200. “The schools (that is, boys’ and girls’) are divided by folding doors, the room being 60 feet long by 25, and 15 feet high, lighted by 8 large windows”. Sometimes curtains were drawn across the middle. “At one end was the platform for the infants, and at the other end, near the fireplace, were the headmaster’s table and chair, from which he kept observation on the top class in particular and of the room in general, other classes coming in between the two ends of the room. This would be before the erection of the infants’ room at the back”. (IA Aug 1929). Sheddie Kyme recalled that the large room, with smoke-begrimed maps suspended on the walls, had “worn and ragged desks, and large green curtains which were drawn during lessons to separate each class. The schoolmaster’s desk stood between the two doors”. The infants’ room had an old-fashioned gallery, rising tier above tier, with a few desks for those a little more advanced in learning. The first headmaster was Mr. Holroyd. The pupil teachers were Sam Cresswell, William Topliss, and Martha Howard. S. Cresswell left the teaching profession, and went to H. Carrier & Sons, Nottingham. He died in the fire that occurred so tragically at H. Carrier & Sons’ Mount Street warehouse some years ago. He married Martha Howard. William Topliss also left teaching, and became F. Sudbury’s first clerk. Unfortunately he contracted small-pox and did not recover. John Holroyd was born in Nottingham in 1834, the son of iron and wood turner Elijah and Sarah (nee Parr) of Lower Parliament Street. Thus he would have been 11 years old when the British School was first opened and therefore probably not its first headmaster! John Cartwright remembers his first teacher, Nottingham-born William Milner who first had a school in Baptist Chapel Yard in South Street, ‘up a flight of steps’. The 1841 census shows him there with his wife Mary (nee Bailey). William was appointed master at the British School when it opened and which John attended, though not before he had been schooled in a room at the back of the Independent Chapel…‘I suppose until the new school was ready’. Established in 1834, the Artizans’ and Mechanics’ Library of 400 books was later at the British School with William Milner as librarian, on duty on Wednesday evening from 7pm to 9pm. By 1850 William Milner had left Ilkeston, returning into Nottinghamshire (Kirkby in Ashfield). Slater’s Directory of that year lists William Martin Hingle as master of the British School in Bath Street. He died in Ilkeston in April of 1850, aged 24. The 1851 Census shows Thomas Walton a native of Stockton on Tees as the British School Master, unmarried, lodging with Elijah and Elizabeth Trueman in Anchor Row. Thomas married schoolmistress Mary Earle, daughter of Hertfordshire farmer Richard and Hannah, at St. Mary’s Church in December 1854. And in 1855 Thomas Walton appears in the Post Office Directory as Master of British School and residing in South Street. In 1855 the Ilkeston News reported on the annual excursion enjoyed by the scholars of the British School. On a bright and sunny Wednesday afternoon in August, 200 excited children, dressed in their gayest holiday attire and carrying refreshments, left their school, accompanied by teacher Thomas Walton and his assistants. Led by the Ilkeston Band and with the girls in front, they marched, two by two, up Bath Street which was lined with spectators. The procession halted briefly in the Market Place before proceeding down South Street and into Derby Road where the band left. Now the rejoicing children continued on to their destination of Dale Abbey, which was reached in an hour. An afternoon of play and picnic then followed before the tired scholars journeyed back to town to be met by the Band in Derby Road and led into the Market Place once more. A large crowd had assembled and for a time all listened to the ‘eloquent music’ played by the band before the event concluded with the playing of the national anthem. Son of Thomas and Mary, Tom Sigsworth Walton was born in Ilkeston in 1856 before the family moved away, at first to Nottingham and later to Grantham, where Thomas kept the Middlemore House Private School in Castlegate. John Holroyd became Master at the British School about 1856. His wife Ellen (nee Gordon) was a schoolmistress and assisted her husband at the school. Old Resident recalls him as a very short man who wore glasses and was passionately fond of cricket. “I have seen him play many a time on the old Rutland Ground, and nobody could fail to notice the peculiar delivery he had when bowling”. In August 1858 George Small West presided over a public examination of the British School children when they were successfully examined in reading, geography, grammar, history and mental arithmetic. They also displayed several beautiful specimens of fancy and plain needlework. The occasion was terminated after a singing of the National Anthem. Everyone was highly pleased. John Holroyd and his family — four of his daughters being born in Ilkeston — left for Braintree, Essex at the end of 1862. “Mr. John Holroyd, for 26 years headmaster of Hucknall Torkard Beardall-street Board School, died at his residence on Sunday. Deceased was a native of Nottingham, and entered the teaching profession at an early age, first as tutor at a large boarding school in Liskeard in Cornwall. After being trained at Borough-road College he successfully held the positions of headmaster at Farrington, Berks., for two years, Ilkeston seven years, Braintree, Essex, two years, and Lewisham Bridge, London, eight years. “His scholastic work has been highly successful. He inaugurated the first science classes in Notts., and obtained excellent results. H.M. Inspector’s last report, received on Friday, runs:– “The Geography was very good: the general character of the work was good, and there is an evident desire amongst the teachers and pupils to improve. The order is very good. I beg to sympathise with the head master in his long illness”. “He was well known locally as a promoter of cheap trips to, and personally conducted tours in Scotland. He was also an ardent angler”. When Mr. Holroyd left Ilkeston he was succeeded by Mr. Wright Lissett, who afterwards became Clerk to the Local Board; and when Ilkeston became a Borough Mr. Lissett was appointed Town Clerk. Numbers grew and the British School flourished, especially under Wright Lissett, headmaster 1863-1873. 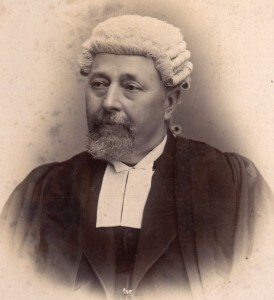 Wright Lissett about 1887. (courtesy of Ilkeston Reference Library). In November 1867 the Pioneer reported the public examination of about 250 of the British School scholars before an assembled audience of parents and friends. In the chair was the Rev. John Bonser B.A., pastor of the Independent Chapel. “A specimen of the reading of each class was given, commencing with the infant class, who also wrote from dictation in a very quick and pleasing manner. The first and second classes were examined in English grammar, parsing, geography, and mental arithmetic, and they acquitted themselves most creditably. The quick and correct way in which they answered the questions was quite surprising, and showed most clearly that they thoroughly understood them, and had been carefully and patiently instructed. The infant class, too, answered questions promptly and correctly in mental arithmetic. Several school songs were sung during the evening with pleasing style, and steady and accurate time. Three songs were given by the infant class with motions and gesticulations, which called forth long and reiterated applause from the auditory. Recitations were given by some of the senior boys and girls, as well as one (‘The Lamb’, Wordsworth) by a little girl of the infant class. Altogether the examination was very interesting and satisfactory, and exceeded the anticipations of the institution’s friends – At the close the Chairman expressed the satisfaction he felt in being present on an occasion like that. He was quite sure everyone must have been delighted with what he had seen or heard”. Surgeon William Date of Ilkeston was on hand to propose a vote of thanks to Mr. and Mrs. Lissett, their assistants and the pupils, seconded by Matthew Hobson. Also present were the Wesleyan Minister James Harris, William Sudbury, Charles Woolliscroft (the secretary to the school) and John Columbine. The children sang the ‘National Anthem’ and the meeting ended at nine o’clock. Wright Lissett resigned as Master of the school in 1873.